Pre Order News: Sanwa OBFSE Silent Pushbutton, plus no more restrictions! Happy Monday! Actually, is there such a thing? I can imagine for many, Monday is the start of the work week, or a hectic day back to classes. I hope that this letter might offer some good news for you and others that shop with FA. n our earlier pre-order system, we had to restrict pre-orders to contain only pre-order items. Upon using our new inventory system, our staff can now manage pre-orders that also contain in-stock items as well. This means that you can add in-stock items to your pre-order, with all items shipping once the last pre-order in your list is available. Click here for a full explanation of the new pre-ordering system. In November 2018, we noticed that some users were experiencing issues accessing our FA Rewards feature. Attempts to contact the service hosting the rewards program and restart the server were unsuccessful until late December, when the server went down for good, and the team responsible for its upkeep was non-responsive. They left a lot of its clients - including us - left without customer data to re-establish another rewards program. Luckily, I was able to get the majority of it through persistence and a helpful internal source. With that data in hand I've completed transitioning to a new program. On March 20, a new version of FA.Rewards was soft-launched on our website. Here you will find a cleaner, simpler interface; each area offers clear indication of how many rewards points are earned currently, rewards to unlock, and what you can do to unlock them. Clicking this tab will display a compact window. There, you will find information on how to register on our website if you have not done yet (registering for an account at FA automatically subscribes you to FA.Rewards. Part of the challenge is converting the previous system into the new one, as the points system differs across the two. The 1 Gold chip = 1 FA.R Point, 1 Blue chip = 25% FA.R Point is the calculation we chose to convert the original program's gold and blue chips. Additionally, some accounts were removed as the customer information was incomplete, however, I do have email addresses and points from all customers available to the program. This is why I suggest contacting our order fulfillment team ( orders@focusattack.com) should you not see points in your FA.R account, or do not see an account at all. As we continue to introduce the new FA.R program, I will have updated information to you soon. Currently available in limited colors (Black, White, Dark Hai, Dark Blue/Black), Sanwa's next-generation silent pushbutton uses no foam padding. Instead, the button plunger itself is designed to minimize the loud "clacking" sound that is made when the plunger makes contact with the housing. Now through release (April 15 or sooner), you can save from the normal retail price when you pre-order. Also listed below is the Sanwa JLFD detachable joystick lever, Sanwa's clever new way to address transporting Fightsticks using a common book bag or messenger bag. Pre-ordering the JLFD also nets you a free LB-35 balltop, Sanwa GT-Y octagonal restrictor plate insert, plus 2/4lb spring and the popular Kowal 1mm oversize JLF actuator! If you haven't picked up a copy of UDON's Street Fighter Wrestlepalooza, there's still time! 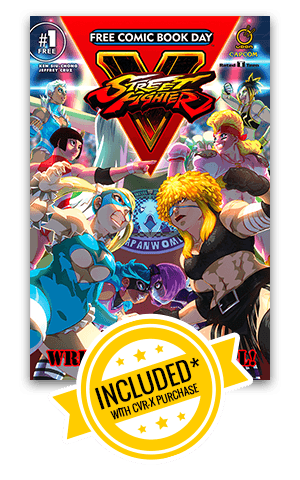 Some of the heaviest hitters and biggest grapplers star in this no-holds barred slice of the Street Fighter Universe. You'll find Alex, Abigail, Mike Haggar, R.Mika and partner Yamato Nadeshiko among the top cast of World Warriors. The gorgeous Udon Store exclusive cover featuring R.Mika in one of Street Fighter V's premium costumes is drawn by prolific video game and comic artist Genzoman. The high-flying action began with Street Fighter V Wrestling Special, a special part of 2017's Free Comic Book Day. If you missed out on this issue, it can be yours by pre-ordering the Limited Edition Udon Store Exclusive variant (CVR X). *Offer is good while supplies last. Wrestlepalooza ships April 24, 2019. Street Fighter Menat #1: Coming to Stores Wednesday! Menat, the enigmatic Egyptian fortune teller is on a quest to avenge her master’s death. But it’s not just any villain Menat is seeking… it’s the Dark Lord of Shadaloo himself – M.Bison! If you're not familiar with Menat, she was introduced in Season Two of Capcom's iconic fighting game title, Street Fighter V. Her bubbly personality with a touch of sass made her an instant favorite amongst many players, though you are forgiven for the salt that flows when on the receiving end of her V-Trigger. Overall, Menat is a lovely example of original fighters that have graced the series' fifth installment. Now, Udon offers a chance to tell her own story in a full color comic adventure. Free USA Shipping When You Bundle! While supplies last, get FREE domestic USA shipping on Udon Street Fighter:Menat #1 when you bundle Limited Edition CVR D or Udon Exclusive CVR X with any of CVR A, CVR B or CVR C variants. Please include both items in the shopping cart to receive free shipping. If ordering multiple copies that exceed First Class shipping weight limit, USPS Priority mail shipping is used instead at no extra cost. Free shipping does not apply to other items in shopping cart. Free shipping offer is limited to domestic USA residents, including Hawaii, Puerto Rico and Alaska. Discount promotion ends when all supplies are exhausted, or March 26, 2019 at 11:59pm US EST, whichever is sooner. If you're looking to take your favorite balltop everywhere you go, you will love the Seimitsu Balltop Backpack Charm. Available in various colors, it's a wonderful little accessory. The strap can attach to any item with a closed loop, such as keychain rings, zippers, carabiners, and other items. To install, simply thread the loop end inside of the open area of the zipper or hook, then pull the balltop attachment through the loop and pull down. This should create a tight loop around the zipper, with the weight of the attached balltop helping to keep it in place. Each charm strap is made of a durable string, braided into a strap, and then coated to keep the threads from fraying. The balltop strap has threading compatible with the Seimitsu LB-39 balltop. In turn, accessory brands such as KDiT that are also compliant with Sanwa and Seimitsu balltops will properly fit. You can pick one up right now! I'm pleased to mention that we'll soon add the Golden Silicone tension grommet from Myoungshin Fanta designed by Arcade Stick Indonesia. Made From ShinEtsu Silicone Elastomer, the Golden Silicone grommet is designed to have holes on corners, enabling equal tension on every cardinal or diagonal direction. Additionally, I'll finally have a chance to reveal something in the works for a while now. I think for fans of this product, they will be happy to see additional love given to it at FA. Thanks for sticking with us through thick and thin. I appreciate the opportunity to serve you and the fighting game community since 2010.